After many, many weeks of being closed due to a mysterious 'ventilation issue', the Paris Catacombs have re-opened. Closed since late September, we were provided with no further information other than to ask us to continually â€œtry next weekâ€ as they were scheduled to open again "any day now". Many visitors to the Catacombs were surprised to discover upon their arrival a mysterious white note, inconspicuously taped to the entrance door of the Catacombs stating that they would be closed until further notice. We were actually promised back in early October that they would be opening on the 10th of that month. Naturally, that was not the case. Such is the Joie de vivre of life in France. 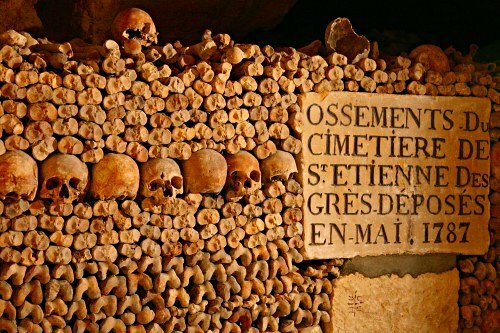 Fortunately, they are now open once again and we are able to accept reservations again for one of our most popular tours, our Paris Catacombs Tour. Please note, there will be no Catacombs Tours available on the following dates: 12/24/2012, 12/25/2012, 12/31/2012, and 1/1/2013.